Here at TokuNation we’ve been slowly going back through our catalog of past galleries, picking out those that didn’t get the proper treatment the first time around, and giving them our gallery 2.0 treatment. And we’ve finally begun to pick up steam with our look back at Tokumei Sentai Go-Busters! Earlier this month we brought you a 2.0 gallery of S.H. 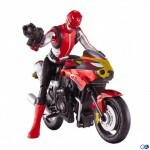 Figuarts Red Buster, today we take a look at Hiromu’s trusted partner (and mode of transportation) S.H. 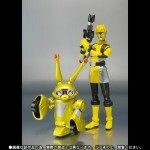 Figuarts Nick Cheeda! Nick came out a few years ago after Red Buster but was released as a Tamashii Web Exclusive. In fact the entire remainder of the released Go-Busters were distributed like this. Nick however was the first Buddyroid release, so he’s completely different from the other Busters. And as with many Web Exclusives of the time, Nick doesn’t include much other than an extra pair of hands and his Rear Wheel Guns, but really that’s all he needs. While the mold isn’t perfect, if you’re a fan of Go-Busters, he’s the perfect addition to your display. We’ve attached a selection of images to this post but you can view the full 40 image gallery after the jump by clicking “Discuss on the TokuNation Forums”. Our 2.0 galleries from Tokumei Sentai Go-Busters will continue next time with a renewed look at S.H. Figuarts Blue Buster! Cheeda Nick‘s accessory count includes a set of alternate hands, and his wheel blasters. Shishioh’s photo gallery also shows off this figure in action with the Red Buster Hiromu. Check out Shishioh’s gallery after the jump! 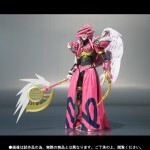 Bandai have recently updated their Tamashii webstore with new images for their exclusive offerings for October. Among the S.H. Figuarts figures for this month include the Virgo Horoscope from Kamen Rider Fourze, buddyroid Chida Nick from Tokumei Sentai Go-Busters and Black Condor from Chojin Sentai Jetman. From GA Graphic comes images of the upcoming, transforming Chida Nick With Red Buster set from GoBuster! This set is scheduled for release later this month for ¥3,990. Check it out after the jump! Thanks to wotakufighter2121 on Youtube we can now check out a preview of DX Go Buster Ace, the primary component of the upcoming DX GoBuster Oh! 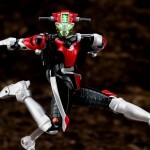 Planning to order DX Go Buster Ace? Thanks to TokuNation boards member ShadowMoon for the heads up!